Indian Astrology is also known as Indian Vedic Astrology or Vedic Astrology. Vedic Astrology can be defined as the science which explains in detail the planetary movements and positions with respect to day and time, and their effects on 12 zodiac signs that influence the personality traits of humans. In short, it depends on the correct positions of the zodiacal fixed sun signs with regards to the place/location on the earth at given point of time. Astrology is based on astronomical terms, astronomy deals with the measurements of different celestial/luminous bodies, computing the longitude of the planets independently, determining the period of eclipse etc. Predicting one’s future through astrology involves preparing natal or horoscope charts. An individual’s place of birth, time of birth and date of birth play a vital role to determine what their future holds for them. 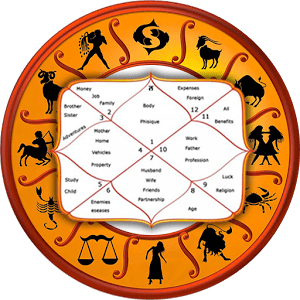 Astrologers use this information to know the correct positions of the planets and zodiac signs and once these are correctly determined, they can construct the horoscope or the natal chart of the individual. By using this knowledge, I analyze the horoscope of the individual in great depth and determine various conclusions and possibilities about the life (Past, present & future) of the person and offer my recommendation and solutions. The Life report is a superb package that includes the following : Your life Predictions + Remedial Consultancy. Acharya Praveen can foresee the unavoidable with reliable time of occurrence, and in addition, ascertain good and not so good developments with regard to Love, Relationship, Marriage, Children, Money, Purchase associated with Vehicle/Property, Career, Overseas Travel, curses, Overall health other things imaginable, which means you learn about the smooth and rough patches that exist round the corner.